CRAPTASTIC: Round Baby, Round Round! Yay! I finished my Spring (and probably summer) wreath last night! I love it! Such a fun pop of color on the porch! I bought all of these from Joann Fabric! The wreath was less than $3, the little 3-pack of H letters was around $1, and the seven 2inch strips of fabric were less than 25cents each, so around $1.75. I already had the moss on hand from a previous project, but it is $5.99 at Hobby Lobby. I chose a strip of fabric to represent each color of the rainbow except green, since the enitre wreath was green. I also chose two more neutral fabrics with some color in them. I followed this awesome rosette tutorial to make my seven rosettes. Sorry, my hands were full and I didn't take any pics! Here they are all finished! Before I started gluing on the moss I spray painted my little H with Valspar's Exotic Sea. I painted it the same color as my front porch chair so it would match! Then I got started on the wreath. I read on several blogs that the moss would stick better to the plastic, so I left it on. I should have spray painted the wreath brown beforehand, but I was too impatient so I didn't! Next time maybe. I would grab a chunk of moss, apply a generous amount of hot glue to the wreath, then press it on. I always use lo-temp glue because I got a gnarly hot glue burn when I was little. I didn't want to glue the rosettes directly to the moss cause I didn't think it would stick well. So I grabbed my felt. After I found the placement I liked on the wreath, I transferred the rosettes onto the felt and hot glued them on. I cut off the excess felt and hot glued the three rosettes as the base. Then I arranged the smaller rosettes into a pattern I liked and hot glued them to the larger rosettes. I wanted to make sure the flowers wouldn't fall off (it's been really windy here) so I grabbed a few nails and pierced through the felt and the wreath. Those bad boys are snug now! I thought about gluing the H onto the rosettes, but I liked it better on the ribbon. The ribbon was left over from some pillows I made. I cut about a 12inx2in strip and tied it around the top of the wreath! I love! Now I just need to spray paint that ugly red hanger! Knowing me though it will probably stay like that! I probably should have sprayed it with hairspray so it wouldn't shed as bad. I might end up doing that later! I still love it though! it looks great and i think the red wreath hanger is just fine as is! adorable, katie! that is sooo fun! i love hte moss and the bright spring colors. That's REALLY cute. I love the moss, gives off that earthy feel. Looks fabulous on your door. This is my favorite Spring wreath that I have seen so far! thanks for linking up!! its FABULOUS! Very very cute. I loved using the colors of the rainbow. Now that should take you into summer as well. Love it! It looks great and I'm sure you'll figure out a solution to the shedding. Thanks for linking up! The wreath came out really beautiful. Thanks so much for sharing it at my Swing into Spring party. Your wreath is very pretty and sure does look like spring! Too cute! I didn't inherit the crafting gene so I have to live vicariously through those of you that did! Looks awesome! I'm loving those rosettes... I'll have to try making a few! Love this. I don't know if you've ever heard of pinterest, but this was on there http://pinterest.com/pin/8379679/ and I thought of you. This also makes me think of you with the letters http://pinterest.com/pin/7274618/ . If you don't use this site, do it! You will become addicted haha. Thanks so much for linking this up to our Wicked Awesome wed party. It looks fabulous Katie! Love where you decided to put the H. Thanks for linking up! This is so pretty and perfectly Spring. I adore the rosettes and the monogram at the top. My front door is currently sans wreath so I need to make one. Thanks for the inspiration and sharing with air your laundry friday! Super cute! I love the moss with the bright colored rosettes!! Sweet...love the roses. Love moss too...but not the mess. It looks great! Came over from 504 Main..
this is as cute as can be. You did a great job. Very cute wreath. Love the rosettes. You did a great job! That looks so adorable Katie! Bright and cheerful just like you. :-) Thanks so much for sharing it at Inspiration Friday this week! 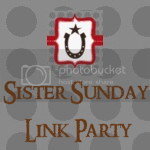 We are featuring your wreath at Weekend Features and our Sister Sunday link party! thanks again! I like the red hanger...but then again I'm totally out od date and still like the 2005 red/aqua color combo. Also your newest follower. Can't resist a blog with crap.